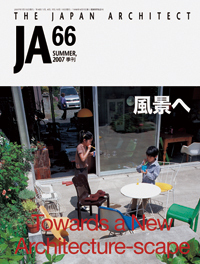 In this issue, JA feature Houses open to surroundings in the cityscape titled Towards a New Architecture-scape. By opening to neighbors, interior, exterior and cityscape seem to be blended together and make new creativity of architecture. This may show us one of the reviews of living way in the city of Japan and Japanese urban housing these days.